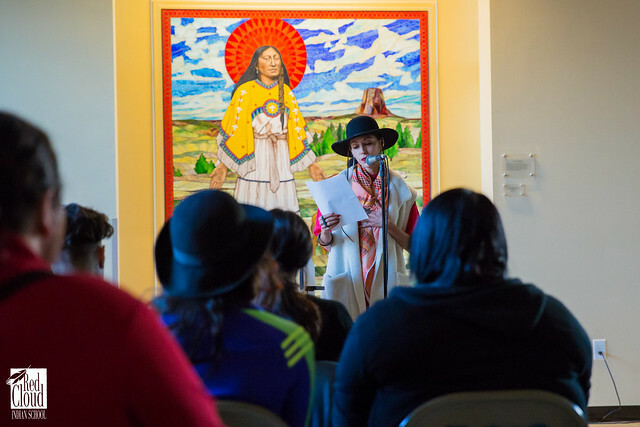 The Heritage Center at Red Cloud Indian School kicked off its first-ever Visiting Poet Series. The new series includes public performances and workshops with students from area schools. The Heritage Center welcomed Suheir Hammad as the first visiting poet of this series. Suheir is a Tony-award winning poet, activist and an alumna of HBO’s Def Poetry Jam. Suheir, who led three days of workshops and community events, talked to students about new ways of viewing and contextualizing their poetry. She also treated the public to a stunning spoken word performance during which she invited Tȟéča Wówapi Káǧa Okȟólakičhiye (TWKO) poetry students to share the stage with her. The Heritage Center is currently scheduling the next visiting poet for a winter workshop and performance week. The time and location of the next free public performance will be announced soon and all are encouraged to attend.